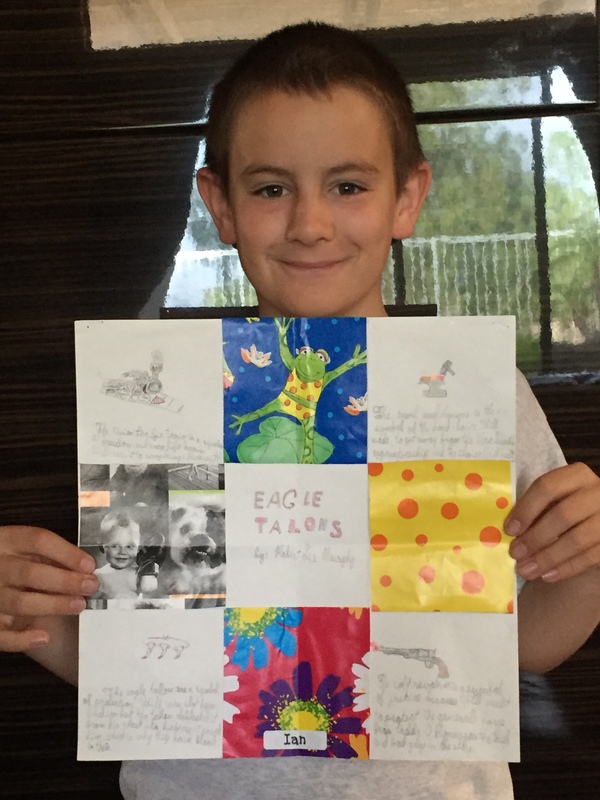 Ian is eleven years old, and this spring he completed the fifth grade at Running Springs Elementary School in Anaheim, California. Ian’s teacher gave his class an assignment to prepare a book report on a historical novel. Ian chose Eagle Talons, The Iron Horse Chronicles—Book One. Ian received a perfect score for his explanation to the teacher and the class about the significance of symbolism in the novel. I include a full spread of Ian’s report to enable you to better read his outstanding work. His comments are listed below his report. The railroad symbolizes escape and freedom. The blacksmith hammer and anvil represent the life Will Braddock did not want. The eagle talons represent protection, because they saved Will’s life. Ian’s interpretation of the symbolism in the novel is impressive. I am gratified that Ian liked my book; because, when I wrote it, my target audience was middle-grade students. As it turned out, the book has become a “cross-over” novel with readers of all ages enjoying it. It is pleasing to have written a book that appeals to the young in age as well as the young at heart. 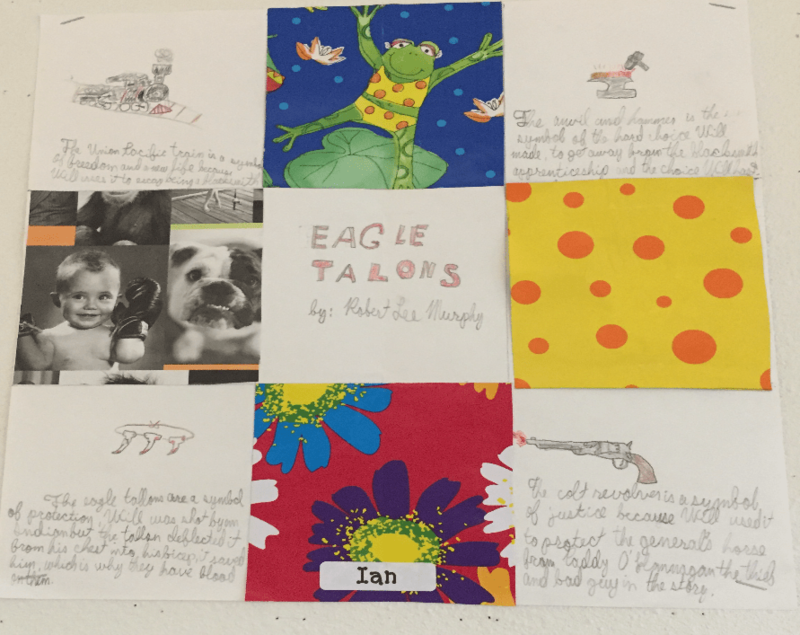 For those who are vision impaired, there is a large print version of Eagle Talons available. Hopefully, Ian’s experience will inspire him to enjoy reading historical novels for the rest of his life. He has passed the word along that he is looking forward to reading Bear Claws, The Iron Horse Chronicles—Book Two. Five Star Publishing will issue that book in November 2015. Thank you, Ian, for sharing your book report with me. I proudly pass it along to the readers of my blog. This entry was posted in Book Review, Eagle Talons - Book One, Iron Horse Chronicles' Characters, The Iron Horse Chronicles, Transcontinental Railroad and tagged Adventure Fiction, Eagle Talons, Firearms, First Transcontinental Railroad, Five Star Publishing, Frontier Fiction, Historical Fiction, Middle Grade Fiction, Teen Fiction, The Iron Horse Chronicles, Western Fiction, Wheeler Publishing Large Print, Will Braddock, Young Readers. Bookmark the permalink. How inspiring to read this young man’s report of “Iron Horse Chronicles. Since I taught 5th graders for 20 years, it pleases me that Ian enjoyed and understood your book so fully.. Way to go! Can’t wait to have Robert Murphy signing his book in my hometown of Farmington, NM on June 22nd. What a thrill that will be!